By Stephen Sherman, Mar. 2007. Updated April 16, 2012. As he tried to climb away, Quenault poured rounds into the German. The Aviatik, riddled with bullets, fell into a dive. Plunging into a copse of trees, it exploded. Thus ended history's first recorded air duel. The unlikely-looking Voisin had prevailed. Gabriel and Charles Voisin were two of Europe's pioneering aviators. Gabriel formed the first commercial aircraft manufacturing company in Europe with Louis Blériot in 1905, buying out Blériot the next year. Re-formed with his brother Charles, the new company, Appareils d'Aviation Les Frères Voisin, delivered its first airplane in 1907, the distinctive Voisin pusher biplane. Flown by many of Europe's leading aviators, on January 13, 1908, Henri Farman made the first one-kilometer circuit in Europe in a Voisin. 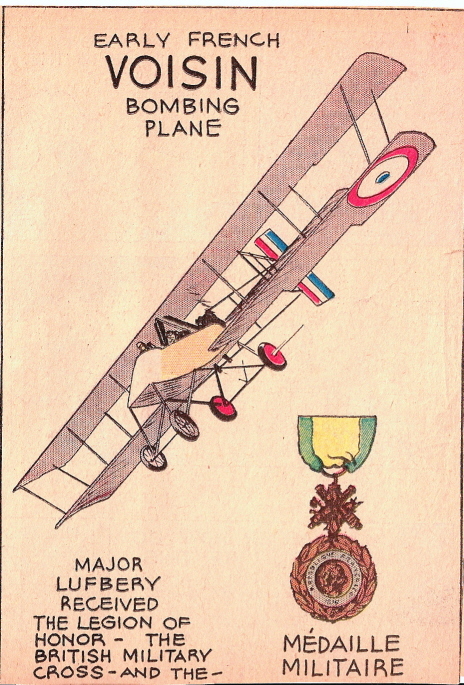 By 1912, Les Frères Voisin had scores of airplanes based on their 1907 design. In 1912, they developed a military version, and subsequently focused on military contracts. The Voisin 1, also known as the Voisin 1912 Type, was the model for all Voisin aircraft developed during WWI. It was an equal-span biplane with no dihedral, a short nacelle for a crew of two in front, and an 80-horsepower Le Rhône 9C engine at the rear. A four-wheeled landing gave it the "baby-carriage" look. The Voisin pushers performed a variety of missions in the war: reconnaissance, artillery spotting, training, day and night bombing, and ground attack. They were slow and with their pusher configuration, defenseless from the rear. Nonetheless, these rugged and reliable aircraft played a role throughout the war, used as trainers and for night missions after they became obsolete for front-line, daytime missions. Voisins were supplied to, or built under license by, twelve countries, including Britain, Russia, Italy, and the United States. The world's first dedicated bomber group, GB1, was organized in September, 1914, comprising three Escadrilles of Voisin III airplanes. Commandant Goÿs, GB1's leader, developed the theory and practice of long range bombing sorties. Bomb aiming techniques progressed from three nails in the cockpit floor, to glass panes, and then to bombsights. GB1 prepared target dossiers which were used for theire bombing raids. In early 1915, Goÿs led his Voisin III bombers almost without opposition, on May 26, bombing a poison gas factory, Badische Anilin Gesellschaft at Ludwigshafen. Of the 18 machines taking part, only Goÿs himself failed to return. Following the success of GB1 other bomber groups were formed. The French continued to make large daylight bombing raids - with as many as 62 aircraft - throughout 1915, but they began to suffer losses as the Germans gained control of the air during Boelcke and Immelmann's "Fokker Scourge". When accompanied by Nieuport Bebe fighters the Voisins were safer, but this limited their range. The Voisin bomber flew in diverse environments, from the freezing Russian steppes to Mesopotamia. The Imperial Russian Air Service substituted skis for rubber wheels. Equally adaptable to desert conditions, the sturdy Voisin VIII was used by the British Royal Flying Corps in the Middle East. The Smithsonian's National Air and Space Museum has a beautifully restored example of a Voisin VIII on display. Acquired in 1918, it languished for over 60 years before being put on exhibit. The Voisin 8 in the NASM collection was purchased by the United States Government in 1917. It was acquired, along with a Caudron G.4 and a Farman aircraft, for technical evaluation. However, by the time the aircraft were transported and prepared for testing, they were already outmoded. In 1918, Lt. Col. L.S. Horner offered to Smithsonian Institution Secretary, Charles Walcott, "obsolete airplanes for exhibition purposes:" the Voisin, the Caudron, and the Farman. When the three airplanes were delivered to the museum, the Farman was deemed unacceptable for exhibition and later returned to the War Department. Like the Caudron, the Voisin arrived at the Smithsonian without an engine. It was displayed in the Smithsonian's Arts and Industries building until 1928 when it was removed and placed in storage. It was restored in 1989-1991 for display in the museum's First World War exhibition. NASM's Voisin Type 8, serial number 4640, is the oldest surviving aircraft that was specifically designed as a bomber. When manufactured in February 1916, it was equipped as a night bomber, with internal bomb racks, cockpit lights, and provision for landing lights. Painted in the markings of French bombing squadron VB 109, it is the sole survivor of the 1,100 Type 8s produced.